I get to perform with these outstanding musicians - Marc Halbheer on drums and fellow Brit, Andy Tolman on bass for an afternoon jazz concert in the Zürich area. We play between 1430 and 1600h and entrance is free! A lovely setting, latin jazz on the terrace overlooking the Matterhorn for Sunday brunch at the Zermatt Unplugged Festival. Following an introduction and performance by Seckou on kora an Alex Wilson on piano, the new material will be performed for the first time by Sinfonia Cymru musicians Abel Selaocoe (cello) and Helen Wilson (flute), award-winning jazz pianist Zoe Rahman, and Paul Moylan (double bass). Dance 2017 away with Nolita Golding and Alex Wilson who will be playing with long time colleagues percussionists Edwin Sanz, Jorge Rodriguez and bassist Leon Duncan. From classic Cuban sounds to slamming salsa soul - this one is not to be missed! HOT TIP - book the 10pm package for drinks and dancing! Bansangu Orchestra is a mighty world music big band led by acclaimed saxophonist and composer Paul Booth encompassing a variety of styles including Brazilian, African and Afro-Cuban. With the basis of jazz orchestra, Bansangu perform their own compositions, which take inspiration from various worldwide influences, instruments, textures and soundscapes. The band is comprised of all-star musical heavy weights and this impressive ensemble will be joined on stage by special guests Claire Martin and Oli Rockberger. A special gala concert at the prestigious KKL Concert Hall in Luzern, Switzerland. Christoph Walter has an impressive big band with vocalist Nelly Patty and this will be a night to remember. Premiere of new work "Journey Around Latin America"
Jugendsinfonieorchester Zurichsee conducted by Roman Brogli-Sacher. I have written my first symphonic work inspired by music from Cuba, Colombia & Paraguay and will perform this as soloist with a talented orchestra of young musicians. Lucy Landymore (Hans Zimmer percussionist) leads this fascinating concert which will be performed alongside a screening of the live 1/8 final of the World Cup featuring music especially composed for the occasion! Some great musicians on board, should be pretty special. I am honoured to have co-written and co-directed this project at André Makounian's "Maison des Artistes" in Chamonix. These dates are part of ongoing touring in Germany, France, Austria and Switzerland. Here are some photos of our show. A great opportunity to play with the great musicians from the salsa band Mercadonegro. These guys live and breathe salsa and it's so nice to be surrounded by this! A fascinating series of events whereby I provide a musical response to the guest speakers and the sermon delivered by the visionary Andreas Cabalzar. At times, my piano crosses over with the dialogue ... at times I respond with a soundscape plus piano. It feels pretty unique! I get to live my other life as a blues organist/pianist on this exciting show with some top Swiss musicians. I get to live my other life as a blues organist/pianist on this exciting show with some top Swiss musicians at the Luzern Blues Festival in the casino for a late night show which starts at 11pm! For the late night party animals! An autumn show with this project which combines cuban and brazilian music with hip hop and reggae and their album "Walking Palante"
A new latin soul star is launched … Nolita Golding … with whom I will collaborate for a set of searing vocals, energy-packed songs plus a sprinkling of soul ballads all wrapped in Alex’s signature latin jazz piano sound with a backing band that packs a punch. Performing new material plus Alex’s well known salsa dance floor hits, these two artists will be fresh from headlining the Saturday night Glastonbury Latino stage … this is a show not to be missed! I am honoured to have co-written and co-directed the new Malia album at André Makounian's "Maison des Artistes" in Chamonix. We toured the project in November and January in Germany, Austria and Switzerland. Now a first date in Cannes with this exciting quartet along with Edwin Sanz and Dimitris Christopoulos on drums and bass. A blast of Caribbean jazz featuring the talent of Monty Alexander’s musician Leon Duncan on bass & vocals, the steel drums of Trinidad-born Junior Edwards, top session drummer Sylvain Petite and the powerful Latin sounds of Alex Wilson on piano. Two cameo appearances with the power guitar duo. in 2012 I was arranger and musical director for their AREA 52 album, working at Abdala Studios in Havana closely alongside veteran producer Peter Asher. We went on to tour the world incl. Sydney Opera House, Radio City New York, Zenith Paris and Bonaroo Festival, USA. This will be happy reunion during their whirwind tour of the US and Europe! Alex Wilson's "Salsa Soul Orchestra"
A selection of past hits and new tunes and will headline the Glasto Latino stage on the Saturday night. Backed up by a blistering array of talent including soul diva Naomi Phillips, Cuban singer Josbel Figurita, Eliane Correa on keyboards and percussion maestro Edwin Sanz plus emerging star Nolita Golding, we will present an energy-packed set which will include a first time collaboration with trumpet star Maite Hontelé. From the salsa dance floor classic Ain’t Nobody, Show Me, Antonio to world premieres of new material … this late night show is not one to be missed. ‘Overflow’ is a no-messin' record of punchy salsa married with gospel vocals and Latin-funk grooves. Highlights include a high octane salsafied version of Screaming Jay Hawkins's 'I Put a Spell on You' and a renewal of Fred Hammond's gospel classic 'We're Blessed'. This show will feature vocalists Naomi Phillips, Nolita Golding and Josbel "Figurita"
Two powerful forces on the Latin scene collide and collaborate on stage at the 2017 Steinway Festival for an explosive encounter. I am honoured to have co-written and co-directed the new Malia album at André Makounian's "Maison des Artistes" in Chamonix. We will be touring this exciting new release in December 16 and Jan 17. Concert featuring reknown American vocalist and young musicians plus Katalin Müller on violin and yours truly on piano! ‘Overflow’ is a no-messin' record of punchy salsa married with gospel vocals and Latin-funk grooves. Highlights include a high octane salsafied version of Screaming Jay Hawkins's 'I Put a Spell on You' and a renewal of Fred Hammond's gospel classic 'We're Blessed'. I am pleased to be curating the 4th edition of the London Latin Jazz Fest and for this end-of-festival show, I will bring together friends from various collaborations including the virtuoso Indian vocalist Unnati Dasgupta in a delicious Afro Cuban setting which will include Venezuelan percussion virtuoso Edwin Sanz. I am honoured to be included as special guest on this special show ...Inspired by the 1972 film Our Latin Thing, Colombian percussionist and 'Godfather of Latin Music in the UK'Roberto Pla leads a 20-piece salsa orchestra to perform the music of the Fania All-Stars, celebrating their influence. Born 1932, virtuoso guitarist Ernest Ranglin is one of the godfathers of Jamaican popular music, leading to rock steady, reggae and ska. Tony Allen, Courtney Pine, Ira Coleman and Alex Wilson will join Ranglin on the tour with Senegal Sufi singer Cheikh Lô. An intimate, one-off show featuring two Belper musicians (one resident, and one born there many years ago!). Dave Sturt has just released his solo album Dreams & Absurdities and we'll be playing some of these tracks, some of my solo repertoire and with special guests Lily Sturt-Bolshaw and George Melton. Along with a powerhouse rhythm section of Marc Halbheer, Leon Duncan and Edwin Sanz, I return to St Moritz to pay tribute to the veteran guitarist Ernest Ranglin. During this one-off show we will play pieces from his various albums spanning his amazing 70 year career. I am the musical director for this intriguing project featuring some top African/world musicians such as Seckou Keita, Marque Gilmore, Adama Bilorou and Davide Mantovani, led by percussionist Doug Manuel with impressive vocalist Kristel Adams. If you come to this show you will play djembe with the band! This is an intriguing project featuring some top African/world musicians such as Seckou Keita, Marque Gilmore, Adama Bilorou and Davide Mantovani, led by percussionist Doug Manuel with impressive vocalist Kristel Adams. If you come to this show you will play djembe with the band! Click below to join us our French tour. Yes it's another collaboration! And this time with gospel keyboard/vocal maestro Nicky Brown. I worked with Nicky on a track for my album Salsa con Soul and I am thrilled to be back on stage with him and his vocalists along with a kicking Afro-Cuban rhythm section. It is part of the London Latin Jazz Fest 2015 and it's going to be a hot one! An honour to be part of this most important of jazz festivals with my trio featuring Edwin Sanz on percussion and Dimitri Christopoulos on bass. On this show we are delighted to have special guest, award-winning vocalist "Malia" perform with us. Venezuelan percussionist, Edwin Sanz, is a virtuoso and after accompanying stars such as Isaac Delgado, Cheo Feliciano, Alfredo de la Fé, Tito Nieves he branches out with his own 11 piece salsa band and album "San Agustin", co-produced by myself and released on Alex Wilson Records. A colleague of mine from two decades back, Malia now has several albums out on major record labels including the latest produced by Boris Blank on Universal "Convergence". Here I am reunited with Malia alongside my close colleague Edwin Sanz on percussion for some winter shows. Two shows featuring latin piano repertoire - original compositions of mine and standards - featuring Edwin Sanz on percussion and Dimitri Christopoulos on bass, performed in a very special jazz bar up in the Alps. featured guest appearance with this fantastic guitar duo. If you come to this show you will play djembe with the band! This is an intriguing project featuring some top African/world/jazz musicians such as Seckou Keita, Marque Gilmore and Davide Mantovani, led by percussionist Doug Manuel with impressive vocalist Kristel Adams. Mighty world music big band led by acclaimed saxophonist and composer Paul Booth encompassing a variety of styles including Afro-Cuban and Brazilian, and featuring the solid improvisational talents of trumpeter Ryan Quigley, trombonist Trevor Mires, saxophonist Jason Yarde and myself on piano. "My aim, as curator of the London Latin Jazz Fest, is provide a platform and shop window for London's array of talent in this genre - new artists, fresh collaborations of established artists in exciting new contexts and, most important of all, a chance for the audience to see great music played with passion!" Click here for the full lineup details. Latin concert in a delightful waterside setting on the shores of Lake Hünenberg in Switzerland, led by Latin Jazz guitarist Andy Bopp. This most prestigious of Swiss festivals hosts a show by my trio which features Leon Duncan (bass) and Marc Halbheer (drums). We play at 11.30pm after a set by Brad Meldhau. Lovely vocal group led by veteran choirmaster Roland Fink and accompanied by Andy Bopp's latin group with myself on piano and Dudu Penz on bass. We play live for the first time the new salsa music released on the 16th June. LISTEN HERE Venezuelan percussionist, Edwin Sanz, is a virtuoso and after accompanying stars such as Isaac Delgado, Cheo Feliciano, Alfredo de la Fé, Tito Nieves he branches out with his own 10 piece salsa band and album, co-produced by myself and released on Alex Wilson Records. June 21st - a midnight concert (the evening of the Saturday) with this exciting Cuban-Brazilian fusion band. Get your dancing shoes on! Malia at "Jazz a Roland Garros"
A colleague of mine from two decades back, Malia now has several albums out on major record labels including the latest produced by Boris Blank on Universal "Convergence". Here I am reunited with Malia alongside my close colleague Edwin Sanz on percussion at this iconic French venue. Exciting salsa-reggae fusion band plays the album launch at a cool venue in Zürich. I featured on one track of the album and will be playing in the band ... should be a great night! 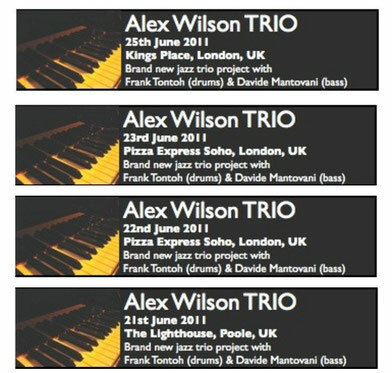 Alex Wilson Trio plays in the Swiss Alps! featuring two excellent Swiss-based musicians, Marc Halbheer (drums) and Leon Duncan (bass) exploring the cross-currents of jazz, linking West Africa with the Caribbean & Latin America ... in the Alps. Listen to the trio album released in 2013 here. Edwin Sanz "Salsa con Clase"
My longtime percussion partner has his own power salsa unit and I will be playing piano for his project in a salsa club in Basel. Come along to dance and listen to some great music! I am playing piano for Cuban saxophonist, Nardy Castellini. We toured the world together playing for Rodrigo y Gabriela, so it will be nice to share the stage again ... this time with Nardy's very own latin jazz project! Please visit the festival website for more information on this most exciting project. As a sequel to the success of Mali Latino, Alex has taken the core of the rhythm section to form a new project. Expect jazz and Latin rhythms stripped back to their African roots – yet fresh, vibrant and definitely modern. With Malian Ahmed Fofana (vocals, guitar, balafon, ngoni, djembe) and Venezuelan Edwin Sanz (percussion). As a followup to the exciting Area 52 project, Alex has been invited to rejoin Rodrigo y Gabriela to form a power trio for an exciting tour not to be missed! On the road again with the most legendary Jamaican guitarist, Ernest Ranglin celebrating his 80th Birthday! As a followup to the exciting Area 52 project, Alex has been invited to rejoin Rodrigo y Gabriela to form a power trio for an exciting Autumn tour not to be missed! Rodrigo y Gabriela Europe summer touring 2012. 16th July 2012 - special guest with the Jazz at Lincoln Centre Orchestra led by Wynton Marsalis Following an invitation to perform with this most prestigious of groups in 2010, I am delighted to be invited back to participate in the 'Afro-Cuban Fiesta' night at the London Barbican Concert Hall, also featuring Pedro Martinez and Omar Puente. As part of the 'Celebrating Sanctuary' event this evening marks Refugee Week and brings this historic London museum to life with art and culture including a solo set by Alex. Musical Director, Arranger and Pianist for the CUBA project, playing at the festival to open up for Radiohead. Musical Director, Arranger and Pianist for Rodrigo y Gabriela USA tour spring 2012. The intimate setting of the Britten Studio is the perfect place to hear this most inspiring and innovative of musicians go it alone. An explosive set of blistering Latin rhythms, meaty trombone sounds and scorching latin piano from Alex’s newly created salsa orchestra. Warm up with dance classes from Salsa Chillout’s Yolande Lewis, a woman with a happy knack of putting everyone at ease and guaranteeing an enjoyable experience of this wonderful partner dance. Alex’s live band set will be followed by a DJ and dancing until midnight – this is an evening of the very best in live salsa music. Aldeburgh Music’s new youth group, Group A, will be joining forces with Glyndebourne’s Youth Opera Group to create their entry for the Carnival. The group will be led by Alex Wilson and three other artists, showcasing a lively and vibrant performance of Cuban rhythms. The Summer Solstice sees a premiere of an exciting new musical work commissioned by Canary Wharf. Directed by pianist/composer Alex Wilson, The Compass Suite takes the listener on a worldwide musical journey. Composing for "North" is Kathryn Tickell, who recently featured on Sting's If on a Winter's Night. British-Bangladeshi composer, Kishon Khan, then takes up the baton for "East" with a compelling fusion of western and Asian sounds. Going "South" to Mali in West Africa, Alex Wilson takes us deep into the Mandingue musical tradition before sweeping across the Atlantic to some steamy, hot Afro-Cuban sounds. We finish by heading "West" for some slamming jazz-funk composed by James Morton which will include the powerful sounds of 10-strong Kinetika Bloco music troupe. Alex has assembled a stellar seventeen-piece band to play this new work - these talented instrumentalists have accompanied Craig David, Incognito, Steve Winwood, Sting, Tom Jones, Level 42, Amy Winehouse, Pee Wee Ellis, Courtney Pine, George Michael and a myriad of other artists. This one off performance of a brand new, cutting edge work is not to be missed .... The Compass Suite.